Sen. Susan Collins, R-Maine, heads to the Senate floor for the vote on the confirmation vote of Supreme Court nominee Brett Kavanaugh, on Capitol Hill in Washington, Oct. 6, 2018. That crowd gathering in Maine isn’t for a sporting event or to buy lottery tickets. No, the scrum consists of potential challengers to Sen. Susan Collins, R-Maine. “Half a dozen Democratic prospects are openly considering running against the Republican political powerhouse, while an online fund has generated $3.6 million — and counting — for Collins’ ultimate Democratic challenger. The would-be candidates include Susan Rice, who had been one of President Barack Obama’s closest aides. Rice is not currently a Maine resident — she has family ties to the state — but would bring political celebrity that could make it difficult for the state’s shallow bench of lesser-known Democrats to stand out. It was not just her vote in favor of Kavanaugh that lit a fire under potential opponents but her preposterous, unsupported assertion that he was a judicial moderate or even a liberal(!) in the mold of former Justice David Souter. Collins proclaimed: “Despite the turbulent, bitter fight surrounding his nomination, my fervent hope is that Brett Kavanaugh will work to lessen the divisions in the Supreme Court.” He’s already done the opposite — in part by appearing next to President Donald Trump’s highly partisan White House remarks. Moreover, Collins seemed to go out of her way during her speech, and later on the news talk shows, to assert that she believed Christine Blasey Ford – but didn’t think Kavanaugh had attacked her because he so vigorously denied it. Sen. Mazie Hirono, D-Hawaii, was openly dismissive and obviously peeved over that argument, which either assumes mistaken identity or Ford’s lack of mental acuity. In short, Mainers who support abortion rights feel as though they were taken for a ride — assured in election after election that Collins was an abortion-rights supporter, led to believe that Collins truly was undecided on Kavanaugh, and then fed a series of disingenuous arguments to justify what Collins had wanted to do all along. 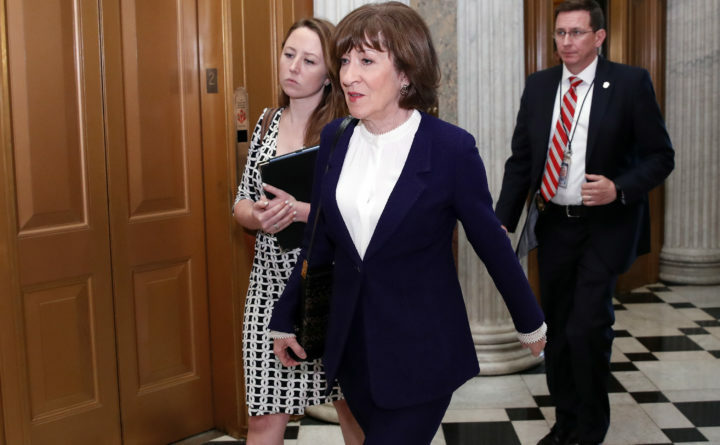 With her over-the-top vote of confidence in Kavanaugh, Collins, in all likelihood, spared herself a primary in 2020 but guaranteed she will face a torrent of criticism for two years — intensified each time Kavanaugh renders the sort of opinion Collins said he never would write. There will be other incumbent Republican senators who may face a Kavanaugh-related backlash in 2020 — Sen. Cory Gardner of Colorado, who persuaded voters in 2014 he wasn’t part of the “war on women”; Sen. Lindsey Graham of South Carolina, who went out of his way to insult protesters and smear Ford as a captive of a left-wing cabal; and, if Kavanaugh helps to disable the Affordable Care Act, a slew of Republicans in competitive purple states. None, however, will be challenged with as much fervor and anger as Collins. Maine voters feel betrayed and they aren’t about to forgive and forget. Jennifer Rubin writes reported opinion from a center-right perspective for The Washington Post.